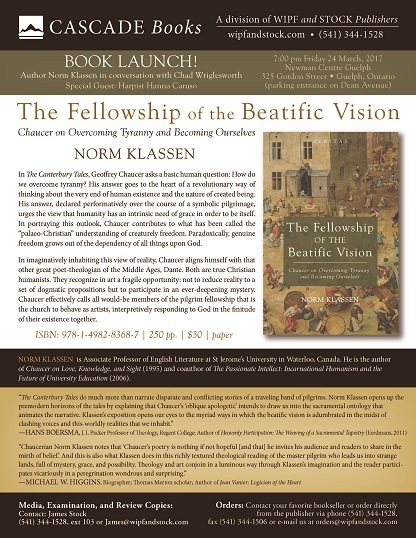 You are invited to attend the launch of Norm Klassen’s book “The Fellowship of the Beatific Vision: Chaucer on Overcoming Tyranny and Becoming Ourselves” on Friday, March 24th at 7:00pm at the Newman Centre Guelph, 325 Gordon Street, Guelph, with parking from Dean Avenue. The program includes a Medieval harp performance by Hanna Caruso, interview with Norm, a reading and a social. This entry was posted in Event, Klassen. Bookmark the permalink.